We had to contend with a litany of ‘I’m too hot; I’m too cold; my goggles are foggy; my helmet is itchy; my clothes are too bunchy; my boots aren’t comfortable; the run is too icy; the chair lift is making me cold; I don’t like the lessons,’ etc. To our amazement, that all changed once we discovered Kicking Horse and its mountain school. Our first time at Kicking Horse was over the Family Day weekend in 2008/9. We put the kids in a lesson (we have two kids) and when we asked our daughter how the lesson went, she actually said ‘FUN.’ She stayed warm, she said. The snow was soft, she said. The teacher was good, she said. She liked her group, she said. She had fun, she said. 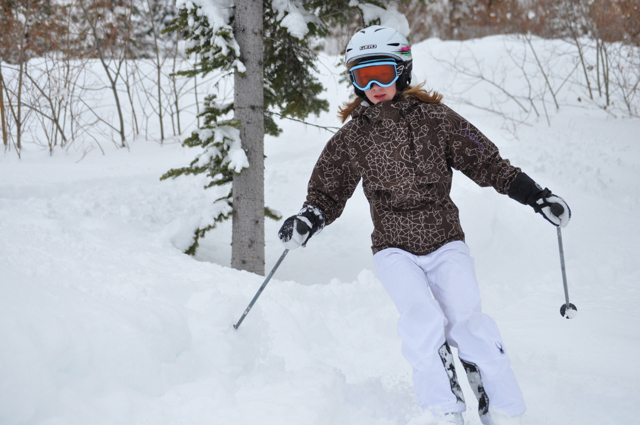 The following year when it came time to decide about a ski program for the season, our daughter declared that if she had to do lessons (she did), then Kicking Horse was where she wanted to go. So we decided to try it out. We bought our passes, booked our accommodations and committed our weekends to skiing at Kicking Horse for the winter. We were pleased to discover the drive was way easier than expected (so much so that we now live in Golden fulltime and my husband commutes to Calgary regularly for work). Between Calgary and the resort, the drive is less than three hours door-to-door. 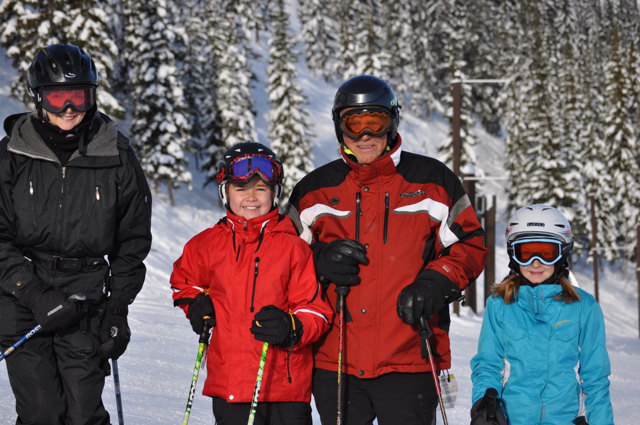 Our whole family loved Kicking Horse from the beginning. While its reputation as an expert mountain is in many respects rightly earned, that’s certainly not the whole story — 40 per cent of the mountain is beginner and intermediate terrain. When we first started skiing at Kicking Horse, the kids were still transitioning from ‘pizza’ to ‘French fries,’ pole planting was more a hazard than a skill, and black diamond runs were still a solid set of lessons away. And while my husband and I are decently capable skiers, we aren’t exactly “shredders.” I’m outdoorsy lite at best. We’ve now been pass holders for six seasons. There’s a lot to love about Kicking Horse – and a lot that made our family decide Kicking Horse was going to be our home mountain. Partly, it’s the terrain (expansive, varied). Partly, it’s the feel of the resort (friendly, smallish, still not too touristy). Partly, it’s the laid back, family-friendly on-mountain après experience. Most people know Peaks because its right at the gondola base but the real treat for a great après is the Kicking Horse Saloon at Winston Lodge). But mostly, I’d have to say it’s the snow. The vast majority of my skiing experience at Kicking Horse is on soft fluffy snow – not ice, not crusty cold snow, not wet heavy snow, but actual soft, often powdery, snow. Nice snow. Good snow. Snow that’s easy to turn in. Snow that can cushion your falls. Snow that you can play in. Basically, snow that’s fun to ski in. I wonder if that’s what my daughter meant when she said her lessons at Kicking Horse were ‘fun.’ Maybe it was the snow all along. Mount 7 Lodges: Luxurious log lodges on an incredible property with breathtaking views. We only ever needed two bedrooms, but three- and four-bedroom lodges are also available. Cedar House Chalets and Restaurants: Another gorgeous property outside of town with individual chalets. There’s an amazing restaurant right on the property and snowshoe/hiking/biking trails right outside the door. Pine Cones B&B: Pine Cones is right in town, a two-bedroom fully-equipped basement suite in a family home. It’s right across the street from a skating rink and perfect walking distance to shops, restaurants, etc. If you love groomers, spend a morning or afternoon skiing the Pioneer Chair, the original chairlift from the Whitetooth ski hill. The chair goes two-thirds of the way up so you get lots of vertical. It gives great access to Kicking Horse’s best groomers and there’s never a lineup. Pioneer Chair is also perfect on powder days – because it’s such an underused lift, you are likely to get fresh tracks well after first ride. Note that this chair usually opens on weekends and holidays only. If it’s a bluebird day, consider skiing the Stairway to Heaven Chair, Kicking Horse’s highest lift. Crystal Bowl is perfect for intermediate to advanced skiers (blue and black runs), and you get the added bonus of full sun and unparalleled views. Don’t underestimate the enjoyment of Catamount Chair, the quad chair that goes from the base to about a third of the way up the mountain. It’s our favourite for when my parents come to visit. We usually do one full top to bottom gondola run for the full mountain experience, then play on Catamount for the rest of the day. There’s lots of dipsy doodles through the trees that the kids love, and Catamount’s always-well-groomed runs make for a day of fun and easy turns.